Raith Rovers went into today’s game at Recreation Park looking to consolidate their position at the top end of the Championship table. Up against an Alloa side looking to make amends after a disappointing result away to Queen of the South, Ryan Conroy’s third goal of the season was all that separated the teams in a keenly contested fixture. Rovers had an almost unchanged starting lineup from the last game v Dumbarton; Mark Stewart retaining his place at the expense of the player withdrawn injured early doors (Calum Elliot), who dropped to the bench in Stewarts place. Alloa lined up with a few familiar faces in their ranks: Buchanan and Holmes having lined up against Rovers for the Pars in recent years, while Stephen Simmons and Greig Spence needed no introduction to the travelling Rovers support. Raith started the match defending the railway end of Recreation Park, but it was Alloa that created the first chance on goal – in the first minute Greig Spence got up to send a looping header goalwards, but Kevin Cuthbert in goal, resplendent in an all – pink outfit, gathered the ball easily. Persistence from Jimmy Scott earned Rovers a throw in near the left corner flag, but McKeown’s long throw was cleared and Cawley, who proved to be a constant threat to Rovers, was able to break clear with the ball. A minute later Anderson again drove down the right into the Alloa box only to be felled with a physical challenge that left him in a heap on the astro turf. Referee Muir was unmoved though, and play continued after Anderson dusted himself off. Rovers goal motivated Alloa to come back into the game, and Ross Perry had to concede a throw in after good work by Cawley, before a cross by Alloa’s talented central midfielder Ryan McCord was caught by Kevin Cuthbert. Next, it was Christian Nade’s turn to impress the crowd of 858 – receiving the ball in midfield he turned his marker and held off 4 Alloa players as he made his way towards goal. Laying off the ball to Scott, the big striker was disappointed that the resultant cross was overhit and drifted harmlessly out of play. Martin Scott then conceded a free kick on the halfway line after he was adjudged to have slid in dangerously with a raised foot on McCord – a challenge in the cup game at East End Park that warranted a yellow card was only deemed worthy of a quick word from referee Alan Muir on this occasion. Stephen Simmons then looked to release Doyle with a raking diagonal pass that McKeown was alert to and cut out to relieve the pressure on his defensive colleagues, before a clash of heads between Grant Anderson and Darryl Meggatt required attention on the sideline from the Alloa physio for a bloodied nose – the Alloa left back continuing after a minute or so. It was 16 minutes before Rovers were awarded their first corner after good interplay between McKeown and Stewart, but (not for the first time) Ben Gordon was able to head clear Conroy’s effort. A minute later Alloa won their first corner after an uncharacteristic mistake by Watson out wide allowed Buchanan to send a dangerous cross in. Perry was on hand to head out for the corner which was eventually headed clear by McKeown. Play was then stopped for nearly 2 minutes after Nade fell heavily in a challenge, but was able to play on after attention from the Raith physio. Martin Scott then conceded a free kick after fouling Simons in mid-air . At this point control of the game was flowing evenly between Rovers and Alloa, and it was in a Rovers break that Mark Stewart showed the best of his abilities; linking well down the left with Rory McKeown, the former Falkirk man received the ball and cut in before unleashing a 25 yard effort that flew narrowly wide of Gibson ‘s goal. A foot to the right and it would have been a spectacular strike. On the half hour mark Rovers captain Jason Thomson embarked on his first run down the wing, having been kept busy by Buchanan for most of the game. Thomson’s burst down the right resulted in the ball going out off Meggatt for another Rovers corner that the impressive Ben Gordon again headed clear. Martin Scott then flashed a strong drive over Gibson’s goal as Rovers attempted to extend their lead in the game. Kevin Cawley then took the opportunity to test Kevin Cuthbert’s shot stopping skills with a long range effort that was saved low to the keepers right for a Alloa corner. Set piece specialist McCord whipped the corner in but Ross Perry did well to clear under pressure. Soon after, Alloa had their best goalscoring opportunity of the game; Another McCord corner was headed onto the inside of the post by Jason Marr, with the ball then flying all the way across goal and out for a goal kick, with no Alloa player able to apply the finishing touch to score an equaliser. The effort off the woodwork marked the start of a 10 minute spell that was almost entirely devoted to pressure being applied by the home team in the Rovers half; Thomson conceded a free kick after bringing Cawley down on the breakaway, Scott conceded a free kick on the edge of the box for handball (somewhat harshly, given that the big midfielder wasn’t looking at the ball at the time) before Buchanan sent a looping header well over the goal. Rovers only respite in this spell of Alloa pressure was a McCord corner that was cleared by Fox to Stewart who was tracked all the way by Doyle and the danger snuffed out. The last notable Rovers incident of the first half was when Nade was tackled in the box, but with the Rovers support and the striker appealing for a spot kick ref Alan Muir waved play on and Mark Stewart wasn’t able to net the rebound. Rovers started the second half with a Stewart shot that Gibson easily saved, then Alloa responded when McCord shot high and wide of Cuthberts right hand post. Conroy then unleashed a drive from distance that was well saved by the Alloa ‘keeper. Christian Nade was then presented with a good opportunity to add to his fist league goal of the season last weekend, when the ever impressive Mark Stewart played him in on the edge of the box; the French Ivorian’s fist touch wasn’t good enough and the ball ran through to a grateful John Gibson. Liam Fox then teed up a volley for himself that flew over the Alloa goal before another Conroy corner was headed well clear by Darryll Meggatt. The 9th minute of the second half saw the first yellow card of the match for the Wasps Doyle, after he handled the ball in midfield to stop a Rovers counter attack before Nade played Anderson in. Cutting in from the right Anderson unleashed a vicious shot that was heroically blocked by Marr at full stretch. Kevin Cawley – easily Alloa’s most dangerous player – then warmed Kevin Cuthberts gloves with a shot to the Raith ‘keepers right. Paul Watson then went up against Spence in a test of pace to prevent the former Raith man breaking through on goal. Doyle, already on a yellow card, then clashed late with McKeown after the Northern Irishman had done well to track back and clear the ball under pressure to halt an Alloa surge. Sensible refereeing from ref Alan Muir, where others might have brandished a second yellow, the official had a quiet word with the Alloa right back. By the time play flowed to the other end of the pitch Mark Stewart had tested the Alloa defence with an acrobatic ‘scissor kick’ that was deflected off the field. The resultant corner was cleared for another, from which centre half Ross Perry had a strong drive blocked and cleared by Gordon. Alloa striker Greig Spence’s name made its way into the ref’s book after the former Celtic, Hamilton and Rovers man caught McKeown late. No arguments from young Greig, who managed to crack a joke with McKeown about the incident. On 65 minutes the first substitution of the game was made by Alloa manager Barry Smith; Liam Buchanan had had a frustrating game up front for Alloa and was replaced by midfielder Iain Flannigan with the more mobile Kevin Cawley pushing on to partner Spence in attack. Martin Scott, maybe with the memories still fresh of a spectacular goal scored from the halfway line last season for Livi, then attempted an audacious effort from a mere 30 yards that went straight to Gibson. Sensing that the win still wasn’t guaranteed, Stewart broke away again but the move broke down when the ball was laid off to Fox who delivered the ball to early and Conroy was unable to chase it as he would’ve been flagged offside by the assistant referee. Then, with quarter of an hour remaining Thomson, Nade and Anderson combined well in a flowing move down the entire right hand side of the pitch to play Stewart in who was crowded out on the touchline. Rovers gaffer Grant Murray, who opted for a different look on the touchline by wearing his Challenge Cup Final suit from last season, then made his first substitution of the match; Kevin Moon (making his first senior competitive appearance of the season after playing the first hour of the Fife Cup tie at Burntisland Shipyard in midweek) replacing wide man Grant Anderson. Moon moved into the middle to partner Liam Fox with Martin Scott taking Anderson’s place on the right. At the same time Alloa boss Smith replace McCord with Ferns, who moved up front to partner Spence with Cawley dropping back to his preferred midfield patch. On the 84th minute Rovers final substitution was made with the impressive Mark Stewart being replaced in a like-for-like switch by young Lewis Vaughan. The former Bradford and Falkirk man can be rightly pleased with his contribution to the league campaign so far, and will give Grant Murray a pleasant dilemma over who to partner Nade with v Hearts next weekend. The main incidents of note in the final 5 minutes of a game (that somehow had another 4 minutes of added time) were Greig Spence receiving the ball out wide on the left before cutting in and attempting a long range effort on goal that didn’t trouble Cuthbert and Martin Scott picking up a yellow card for a foul on Stephen Simmons on the halfway line. Overall, Rovers can be happy about picking up 3 points at a ground where the opposition have always provided a stern test – in the end one goal was enough to seal the deal at Recreation Park, and defensively Rovers looked sound throughout. The first big test of where Rovers are looms large when Hearts visit Starks Park next Saturday…..
Spence in the box with an early header across goal, Cuthbert gathered easily. Stewart with an attempt on goal the deflection came to Conroy who bulleted the ball high into the net. GOAL ROVERS. Thomson denies Buchannan heading clear a high ball into the area. Nade impresses the away support with silky skills in the Alloa half. Play going back and forth in the middle since the early goal. Stoppage for a minor injury to Meggatt. Buchannan wins a corner and then spurns a chance with a poor header. Nade down on the field. Fox cleared well to Stewart who ran 25 yards, turned two defenders and shot just wide of the keepers left post. Rovers having slightly better of the play so far. Anderson winning a corner, Conroy hits the ball across goal where Stewart is denied by the head of a defender. Cawley shoots from 25 yards forcing Cuthbert into a diving save to his right post. From the corner, Raith get a let off, Marr's header coming off Cuthbert's left post and across the face of goal. Meggatt with a free kick from 24 yards out hits the wall and the ball is cleared. Buchannan free in the area, his diving header going way over the bar. Play has ebbed back in Alloa's favour in the last 10 minutes. Nade denied 6 yards out the ball is recycled by Anderson who passed to Stewart in turn he is denied by Gibson. Buchannan with another header, again way over the bar. Doyle bad foul on McKeown deserves a second yellow. Alloa force a corner. Gordon not too far away from getting his head to the ball. McCord off. Ferns on. Anderson off. Moon on. Moon alongside Fox. Scott out to right midfield. Not a memorable match at all. The strong wind is one of the factors. As it stands QoS go top of the league, leading 4-0 away at Dumbarton. +3 Rovers break and try to run down the clock but it's a goal kick. Full time now. A solid away win. Gibson, Doyle, Gordon, Marr, Meggatt, Simmons, Holmes, Cawley, Buchannan, McCord, Spence. Subs, Docherty, Asghar, Hetherington, Flannigan, Tiffoney, Ferns, McDowall. Cuthbert, Thomson, Perry, Watson, Fox, Anderson, Conroy, McKeowan, Stewart, Nade, Scott. Subs, Callachan, Moon, Elliot, Vaughan, Ellis, Matthews, Laidlaw. Rory McKeown gets in an early cross. Jimmy Scott just fails to connect allowing Holmes to head clear. .....to Ryan Conroy to fire Raith in Front. Christian Nade closes down Marr. Mark Stewart keeps his eyes on the ball. Stewart tries to drill the ball past Simmons and Gordon. Scott has a "go" from outside the box. Cuthbert knocks the ball for a corner. Lucky escape as Alloa hit the post. Jason Thomson splits the Alloa defence. 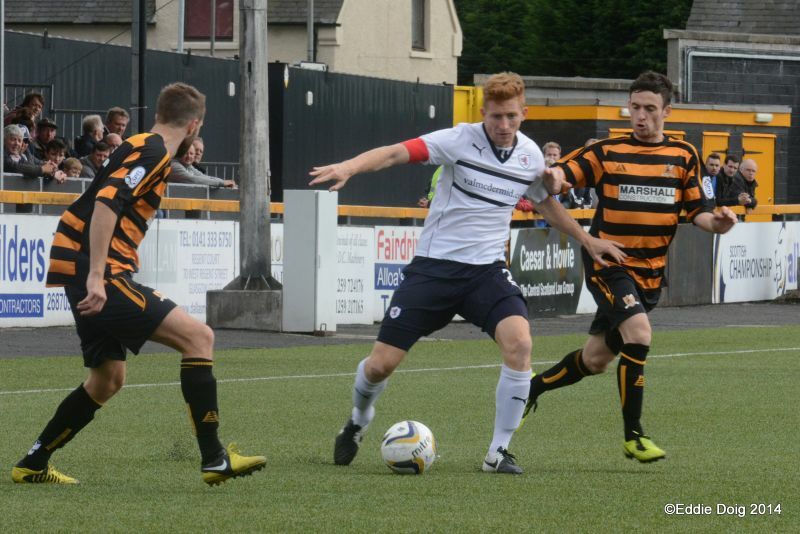 A last ditch tackle by Marr prevents Stewart from getting into the Alloa box. Scott takes on ex Raith man Simmons. Nade is surrounded by "Wasps"
Grant Anderson prepares to send in a cross. Nade forces his way into the Alloa box. Lewis Vaughan is tackled by Meggatt. Martin Jimmy Scott showing good ball control. Raith Rovers head to Recreation Park to face Alloa Athletic on Saturday, looking to build on last weekend’s promising 3-1 home win over Dumbarton. Second-half goals from Paul Watson, Ryan Conroy and Christian Nadé, meant that Raith ended the first round of fixtures at the summit of the Championship table, a position that they’ll be hoping to consolidate against Barry Smith’s side. Alloa will be hoping to get their first points on the board, after a 2-0 defeat at Queen of the South on the opening day. The scoreline only tells part of the story however, with Queens’ 2-0 half-time lead slightly flattering, after Alloa started the match brightly. Like Raith, the Wasps have brought in several new faces over the summer, with Barry Smith concentrating predominantly on refreshing his forward options, as well as bringing in some attack minded midfielders. Greig Spence is obviously well known to the Raith fans after two years at Stark’s Park, and he could be partnered up-front with ex-Dunfermline and East Fife forward, Liam Buchanan, or former Stirling Albion striker, David Weatherston. Goalkeeper John Gibson has been signed from Dundee, after the talented Scott Bain left the Rec’ during the summer, to head in the opposite direction. Left-back Mark Docherty has signed up after leaving Stranraer, while former Motherwell midfielders, Adam Ashgar and Steven Hetherington, have both been reunited by Barry Smith. While a Callum Booth free-kick was enough to hand Raith the victory the last time the two sides met at this venue in March, Recreation Park has been far from a happy-hunting ground for the Kirkcaldy club recently. That 1-0 win was Rovers first in eight visits, a run that went all the way back to April 2007. However, in the last ten league meetings between the two teams, Rovers have won five and lost only twice.